Surviving a flood or a fire is a traumatic and exhausting experience. There is more to cleanup than just getting rid of the excess water. In the event of a flood, fire or even a ceiling leak, moisture from the water usually builds up in the home, which can lead to the spread of mold and bacteria if ignored. But where in the home? 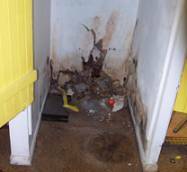 Where can this excess moisture be found and how can you thoroughly restore your home after water damage? Consider some commonly affected areas. If it has rained heavily, then your ceiling tile may be the most affected area of your house, even more so than a wet carpet. The safest course of action would be to remove damaged ceiling tiles within 1-2 days if possible. Drywall similarly should be removed and replaced if affected by water damage. If the drywall and insulation is not replaced within a day, then the bacteria will grow quickly. It will become much more difficult to remove later. Strong odors and visible growths will be apparent if a damaged piece of tile or wall is not replaced. Remember to wash your hands and body carefully after working with flood-damaged tile. There are some health hazards when working with highly polluted floodwater, which has seen the likes of farms, ranches, sewer systems and septic tanks. After a flood or any other major water catastrophe (even a ceiling leak) remember to approach electrical outlets as possible shock hazards. Water and electricity don't go well together. Don't declare any shock hazards safe until an electrician agrees with you. Turn off the power in the water damaged areas (though preferably an electrician should do this to avoid accidents) before examining and replacing wet equipment. Sad to say, upholstered furniture that has been flood damaged should be thrown away. No one said a flood was fun. Leaving a soaked piece of furniture in your home is a health risk. Floodwaters are not just made of rainwater-which is polluted in itself-but contaminated water from all sources. However, hardwood furniture and laminate furniture might still be saved after a careful cleaning with bleach, soap and air-drying. However, discretion is needed here. If a piece of furniture is clearly damaged and shows signs of water damage, (for example furniture that loses its laminate) then it should probably be discarded. Though replacing pieces of furniture after a flood or fire is an unpleasant experience, remember that it could have been a lot worse. Protect your home after the catastrophe and don't let your surviving furnishings become pollutant sources. Remember where that water has been!